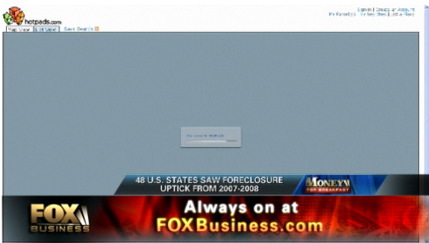 I came across a video of a segment that aired on Fox Business News about HotPads.com, which is an online housing search website (rentals, sales, etc). As I was watching the clip I noticed that beautiful little preloader we’ve all come to know and love 🙂 HotPads uses a custom map engine they developed in Flex (after porting an older Flash app). And if you haven’t checked out hotpads before, it’s pretty dope. In addition to seeing rental listings on a map, they let you see some cool heatmaps of various things like foreclosure rates, income and age levels, etc. And it’s Flex, so show some love people. Disclaimer or whatever: The guys who founded and run hotpads are friends of mine, I even did some work for them back a few years ago. I’ve got a little investment in the company that will one day either make me rich or hopefully at least buy me a six pack of beer. Being in the midst of a 2 yr search for the right home at the right price… I’ve thought about a similar application and had been surprised NONE of the mega-realtor companies have one. You’re chances of making a six-pack just went up. Jason, you should check out Zillow (zillow.com). It’s not associated with any realtors, but they have a lot of the same information… including which houses are for sale.